The Unholy Father has not lost an occasion to make another snide remark at orthodox Catholic. 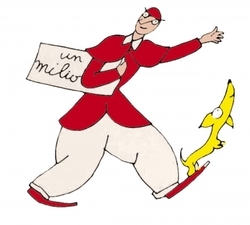 Commemorating the anniversary of the first Novus Ordo Mass in Italy, TMAHICH abandoned himself to the usual sugary rhetoric, saying that “[he] who goes back is wrong”. What a stupid, stupid thing to say. If he who goes back is wrong no error is ever corrected, and no wrong is ever put right. This is another example of kindergarten rhetoric for the little children, the Pollyannas, the retarded and the enemies of Christ. Fifty years later, how little people know of Catholicism is outright frightening. They understand the language of a Mass… they do not want to attend. They are the first generation (and a half) of Catholics who think the Church “wrong” when they do not agree with Her. They are being poisoned by the first generation (and a half) of priests telling them their input is very valuable. The Novus Ordo must die. It has made enough damage already. Yes, it is valid. Yes, it can be celebrated reverently. Yes, you still have the duty to attend to it. But there is no denying that in the great scheme of things the deterioration of the liturgy has accompanied, and contributed to cause, the deterioration of Catholicism. Novus Ordo, Moral Relativism, Abortion. The Novus Ordo must die. He who wants to go on on this path of destruction makes the work of the devil. Posted on March 10, 2015, in Catholicism, Conservative Catholicism, Traditional Catholicism and tagged Novus ordo Mass, Pope Francis. Bookmark the permalink. 34 Comments. If – as I heartily concede – the NO is the work of the devil, assisting at it would be sinful. No duty can bind, which would compel us to participate in sin. I am frankly fed up with this crap theology where people come here and decide that what the Church gives them is not good enough. The devil can salt the soup your mother gives you. That’s the official position of the SSPX isn’t it? Lefebvre never said not to attend to a Novus Ordo Mass, and it has always been understood that the NO has sacramental validity, & Co. But you must pay attention that this mass is not such a mess that it is even invalid. The fact that one says that the NO is bad does not mean that one should refuse it at all costs. It would mean to say that the Church is not in a position to offer a mass that does not constitute a sin for those who participate in it. Madness. Nonsense. You must, btw, understand Lefebvre in his context. In those times there were masses around that truly defied imagination. Vox Cantoris has just left his recollection of masses with “Hey Jude”, “Bridge over troubled water” and the like. A reverently celebrated NO mass is second-class fare compared to the TLM, but it still is the fare the Church gives you. “The Church imposes the obligation to hear Mass “in the Catholic rite,” but a protestantized rite cannot at the same time be characterized as Catholic. Moreover, a “protestantizing” rite exposes the faithful to “considerable spiritual harm,” which is one of the strongest reasons exempting from the Sunday obligation of assistance at Mass. And as it involves danger for our own faith and for that of our dependents, for whom we are responsible before God, we must say that whoever is conscious of this danger, insofar as he is conscious of it, far from satisfying the Church’s precept, rather commits a sin against faith [by attending the N.O.M. ].” Emphasis mine. You don’t need tyo be a genius to understand that this is wrong, possibly taken out of context, and extremely dangerous for your own salvation. You should read the texts of Archbishop Lefebvre himself (I read several books of him, forgive me for not having the quotes ready for every nutcase who thinks he is exempted from attending the NO Mass), and get some perspective. Allow me to to say here that I have no understanding and no patience whatsoever with people who tell me that the NO Mass isn’t Catholic, and I would put Bishop Fellay himself in the category if he were to say something of the sort. You are reading the wrong blog, but most importantly, your eyes are being blind. Careful, there are those who take it one small step further,and believe (or claim at least) that the current state of affairs within the Church exempts them from all sacramental life. Some of these are quite vocal on Traditional fora/blogs in fact, nor are they without access to to Traditional sacraments. There will always be those who are wrong. I am very scared of people who think they are too good for what the Church dishes to them. It is the same stench coming out of the “Tablet” in the end. I suppose they argue a priori that if these rites are inherently vicious they cannot have come from the Church, and so what appears to be the Church isn’t the Church? There can be NO ARGUING that the Church gives you a rite that is not Catholic. Ok, so the SSPX is heretical. That is what they teach. Over and over again. You are oversimplifying, and being blinded. The SSPX isn’t the ALL Perfect Catholic Machine. People like Bishop Williamson (who has his followers among them, overt or covert) promote a radical opposition to the NO that was not in the intention of the SSPX. Have you ever reflected that Archbishop Lefebvre signed all the conciliar documents, when many other bishops refused to do so? With the Williamson standard he would be a traitor. Also consider that the criticism of the NO (which was harsh, at times, in Lefebvre himself) came from the background of horrible abuses that were taking place everywhere, and must be seen in the context of the concrete circumstance in which the statements were made. But let me tell you this once again: to say that to attend the NO is mortal sin is crap, and will not be tolerated on this blog. If Bishop Fellay were himself to comment here and write such crap, he would be banned immediately. But again, no Fellay would ever dream of telling you that a reverent NO mass like, say, the one celebrated by the Oratorians and in many other places is “gravely sinful”. Heavens. Then he would have all the hierarchy and those he speaks with in the Vatican in permanent state of scandal and mortal sin. Why would he speak to them in the first place? Would he refuse to give them communion if they attended a SSPX Mass without confession? It is simply untenable to say that the Church has basically not offered a mass that was not a mortal sin until the Indult in 1984, and keeps now largely sowing mortal sins among the faithful, or at least a mass whose attendance constitute grave matter. I, for myself, am fed up with this crap. I believe in an indefectible Church, and what you are saying is that the Church has turned in an all-out satanical perdition machine. What you and yours believe is beyond the pale of Catholicism. The Catholic Church was turned head-over-heels in 1965, and as the Church turned, so did the world. The slide away from “what-always-was” into “what-ever-you-want” carried as a natural consequence from Church into the world. False religions are now hailed as The Truth, The Way and The Life.. Die wrapped in the state of public affirmation of abortion and you will be granted a Solemn Requiem Mass; Defend the Mass of Pius V and the eternal Magesterium of the previous 1,000 years of Christ’s Church and be branded schismatic and out-of-communion will Rome. Be attached to EF Mass and be ridiculed by the Pope. How in the name of all that is good and holy can VII and most all that stems from it ever be justified as necessary, let alone be termed a “New Springtime” for the Church, when dissension, derision, and denial seem to be its children? Do you believe there are any Cardinals who, if elected pope, would, in short order, discard the Novus Ordo and restore the Traditional Latin Mass? I know Ranjith and Burke are great friends of the TLM, but I don’t know that either would be so bold. I know there are several “Siri Men” in the College as well, but I don’t believe any have tipped their hand on this topic. I do not think there are, and if I were Pope I would not do it either. Getting rid of the NO would have to be made in the course of decades, caring for sound formation of new priests as the older ones are severely punished for every attempt to bastardise the TLM. But this is what the Church always did: think in years, not days. Amen! Your clarity never fails to refresh, M.
What an idiotic thing for him to say. I am not surprised. Pope Francis seems indifferent to the spiritual welfare of Catholics, but wants to excel in his talent for insult. More of the same. I think at least a person should try hear a diocesan indult Mass or a Mass given by a priest of the Society of Pius X. Is Francis not blind and deaf to the failure of the Novus Ordo Mass? Does he not see all those closed monasteries and convents or religious schools that need lay trusts to continue in operation as they don’t have even enough religious for a management team? I can well believe that Pope Saint John XXIII shouted ‘stop the Council, stop the Council,’ His might have had slight Modernist leanings as suspected in his earlier career, but he must have perceived how ultra-Liberal lunatics had taken hold of the Council. I think Francis sees the devastation. If John cried that, he should have had the guts to act on it. He cried ‘Stop the Council’ on his deathbed, it is claimed. I erred a bit in what I typed. At that point, if he did say that, it was irrelevant. Everything about Jesus is extraordinary! Everything about The Extraordinary is about Jesus! Please correct me if I am wrong, but my understanding is that this 50th anniversary Mass is not in commemoration of the first Novus Ordo Mass in Italy. NO did not exist in 1965, and only came about several years later. I believe the occasion is the 50th anniversary of the first vernacular Italian-language mass in Italy. The mass would have been essentially a traditional 1962-type mass, mostly in Italian, and I believe the canon would still have said in Latin. I do not know. Maybe. I do not think something like that would have been allowed at all. Rather, in 1965 there were already provisional versions of the new mass, like prototypes of a new car if you wish, and I am assuming this is what Paul celebrated. A preview of things to come, like – to make another automotive example – those show cars presented at salons to preview a new design language. At the Brompton Oratory the sung Mass at 11 is extremely similar to a TLM, but in fact it is officially a Novus Ordo, the intermediate stage still very similar to the TLM and obviously in Latin. I think it was C.S. Lewis who said that sometimes the only way to go forward is, indeed, to go back, e.g., when one has gone far down the wrong road somewhere. His constant bumper sticker reflections like this make me question his seriousness as a person. This pathetic creature is wrong, wrong,and wrong. When I was reading my way into the Church back in the 80’s God gave me a spiritual appetite only for pre-Vatican II literature from the best sources. LOOKING BACK saved me from the modernist pony poo that flooded Catholic book stores that I browsed for the few descent volumes that actually taught the Faith clearly. The best books in my view are published Thomas A. Nelson (TAN ). Orthodox to the core. When I was younger, and confused, and yearning for truth, I used to go to the biggest bookstores in town and look for something that would quench my thirst. Effeminate V II rubbish everywhere, so sugary and fake I still can’t believe anyone can believe that rubbish in good faith. By the grace of God, the Internet was the first step that saved me from confusion and error. This pathetic creature is wrong, wrong,and wrong. When I was reading my way into the Church back in the 80’s God gave me a spiritual appetite only for pre-Vatican II literature from the best sources. LOOKING BACK saved me from the modernist pony poo that flooded Catholic book stores that I browsed for the few descent volumes that actually taught the Faith clearly. The best books in my view are published by Thomas A. Nelson (TAN ). Orthodox to the core. Perhaps this is a stupid question: Why couldn’t the TLM words have been translated into approved local vernaculars without all the other changes? I think it wasn’t a TLM. I do not think the TLM was ever meant to be translated. I think it was a halfway Novus Ordo, which still looked like the old with elements of new. See the other answer. I might be wrong of course, but this is my reading of the event. I know for sure that there was more than one stage of “Novus Ordo”, it’s not that we went from “all old” to “all new” overnight. The N.O. (Cranmer’s creature, BTW) did incorporate some bits of this rite, but the result was largely desacralised. Videos of the Rite are online but in Latin IIRC, save the Bidding Prayers. In my teens, at university, my sister and I would attend a Church near school that had a ‘hybrid’ Mass at noon, with the canon in Latin. I think it was the ‘child’ of the Mass (sorry for all of the quotes…) that Pope Francis was honoring. We were searching for something close to tradition, but it was still very disquieting, and the first time we attended, we wanted to leave before the canon began. Very strange days they were. I would much prefer this open, scrambled forum of the internet to the strangled and silenced Traditionalism of the 70s and 80s. Exactly! It was gradualism gone awry – the proverbial boiling of a frog. I was a boy of 9 in 1965 and remember going to Mass and there was literally a plywood table covered in a cloth and some stubby candles on each side and poor Father Carroll, God bless him, looked like a dear in the headlights. The Canon was still in Latin and it was said aloud, then in 1967 the whole think was in English and Canada was the second after South Africa to do this. After that it was change, change change. In fact, when the “Novus Ordo Missae” came in in 1969 nobody really noticed. It was just another experiment. We were told in 1965 that this was the “New Mass” so I guess we now have the “New” New Mass. Music at school Masses included Bridge Over Troubled Water and Let It Be because of course, it was about Mary and Hey Jude was about, well, St. Jude. Dignitatis Humanae -> religious liberty -> Satanolatry, indifferentism, apostasy & ISIS.